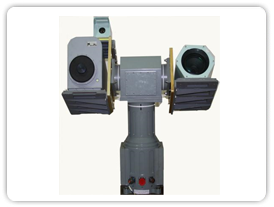 Two Axes Electro Optic pedestal is a stand-alone system for providing continuous rotation motion as defined by commands. The pedestal is elevation over azimuth assembly as shown in the figure . The elevation assembly has got the interface brackets on either side to mount the cameras. Azimuth housing consists of a powerful DC motor with a precision gear mechanism coupled to the azimuth shaft. Similarly another DC motor with precision gear is coupled to elevation shaft, which hold interface brackets on either side. There is a slip ring in the azimuth assembly for feeding signal and power lines to the elevation drive and payloads.